I’m pleased to launch my second album of guided meditations. This brings together work I have being doing over recent years with sensitives and empaths. Click here for more information. That is the gift of your life and something to be treasured. And you can continue to find ways to be “more you”. When we are challenged and overwhelmed we can lose connection to that gift, the power of our individuality and all the resources and instinctive wisdom we have to bring to whatever we are called to show up to in our rich and unpredictable lives. I offer teaching, individual and workplace coaching and resources to empower you to create the best possible self care and lifestyle conditions for your thriving at home, at work and in all your relationships. I am your ally and guide on your journey to be your own unconditional self-advocate and skilful inner coach. 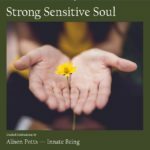 I help you discover and nurture your inner wisdom, instincts and inspiration and to work through challenges by retrieving your relationship with your deep self. A major part of my offering is a natural, intuitive approach to meditation that may surprise you, yet at the same time feel surprisingly familiar – since it comes from within your own individual being and cherishes your uniqueness. I specialise in working with people experiencing the journey of chronic illness, anxiety and depression. However, I also work with many individuals who simply want to keep their routes into themselves healthy and alive through practices of self tending and those who want to engage in a healthy, natural, relevant approach to meditation. I am a meditation coach, well-being mentor, writer and teacher in self-care, meditation and wellness. Originally from Britain, where I had a career in radio production and publicity management at the BBC, I now lives in Brisbane, Australia. My work is dedicated to teaching practices for greater self-connection, self-worth and thriving, including yoga, meditation and personal coaching. I am passionate about the practices of self connection, self embrace and cherishing all one’s sacred instincts. I have meditated instinctively all my life. All my life I have heard a vibration, “a hum” underlying everything in the universe. Even as a child, I felt magically drawn to spending time gazing at the sky and the clouds, at the night sky and the moon and stars, feeling the vibration of that hum and feeling as though I were travelling in infinity without leaving my being. I was brought up in an agnostic family but I cannot remember a time, even in my youngest years, when I wasn’t called by some sense of spiritual life. As I grew with this, I became fascinated by all the world’s spirituality and particularly the human ache, urge or longing, to experience something “higher” or “deeper.” My degree is Comparative Religion and my final thesis was on the sacred in every day life. Looking back, I can see how my innate practices fortified me when things were tough. I had a vivid imagination and spent as much time as possible outside, in nature, daydreaming and visiting all kinds of mystic worlds. I experienced some difficult things, but always had a place to recover, to rebuild, to experience something other than what I was going through. In this way, I stayed close to my instincts and my guides. Life is challenging and as much as I have experienced connection I have had periods of tremendously painful and sometimes very dangerous, connection. Then, 25 years ago, I met a challenge that forced me to commit truly to a journey to reclaim my connection to my instincts when I was diagnosed with MS. At that time, there was no treatment or cure for MS and I faced an unpredictable future with no guidance except for what I knew must exist within me. So began a magical journey of healing and self discovery – ultimately I discovered that living from the inside, cherishing your instincts, honouring and celebrating your deepest needs and desires and being in a daily practice of welcoming and tending to all parts of yourself, is the key to thriving in life. My passion for sharing this by teaching a meditation of connection comes from having travelled the path and found in it, the universe. In 2008, I left my lifelong career in the media to deepen my yoga practice. I moved to Australia in 2010 where I studied with world class yoga teacher Julie Smerdon at Shri Yoga in Brisbane. In 2013 I met Dr Lorin Roche, the pioneer of instinctive meditation techniques, author of The Radiance Sutras and a number of books on meditation and a meditation trainer of over three decades. I have studied with Dr Roche ever since and am privileged to have him as my mentor and teaching supervisor. I am a qualified yoga teacher at 200 hours as recognised by Yoga Alliance in 2012, and a qualified meditation teacher at 200 hours of Yoga Alliance-accredited Pranava Meditation obtained via individual training and mentoring from Dr. Lorin Roche. I am the first meditation coach in Australia to have received the latter qualification. I am on the Faculty of the international The Radiance Sutras Teacher Training and Live Your Bliss Teacher Training in Brisbane, both accredited by Yoga Alliance. I have been published in BBC Online, Australian Yoga Journal, Elephant Journal, Smart Healthy Woman Magazine, Active In Brisbane, Red Magazine, The Bliss Blog, The Shri Blog, Shut Up & Yoga and am a regular contributor of blogs and guided meditations to the global organisation Overcoming Multiple Sclerosis. I am also an official contributor of The Mighty and a guest presenter at the 3rd Breast Cancer Rehab and Wellness ONLINE Summit.